The metal double doors click open. I step into 116B Lewisohn Hall, down the main aisle, where rows of desks are housed in an entirely white room: white-painted exposed brick walls, white plaster ceilings, and white linoleum floors. 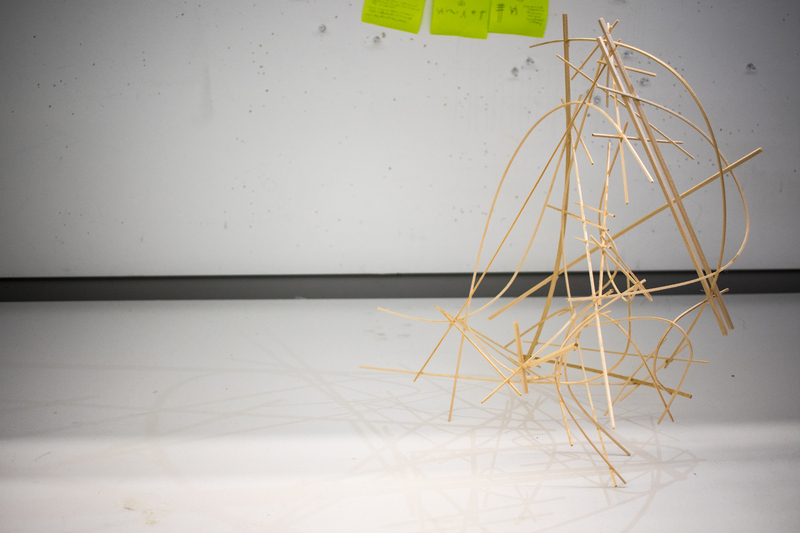 Inside, students and a professor critique one student’s architectural model. Huddled together, they squint, furrow their brows, and tilt their heads to the left and to the right. The way they all lean into the discussion draws me in and makes me want to join. “The desk,” Professor Karen Fairbanks, chair of Barnard and Columbia’s Architecture Department, explains to me in a later interview, “is the beginning of our relationship with our students.” Having taught at Columbia and Barnard for over 21 years, Fairbanks has watched and worked with hundreds of students who, hunched over their desk spaces, toil over models and develop their minds as architects. I step further into the studio and my eyes drift from desk to desk. Each student’s desk, which can be occupied for a full semester while students are enrolled in architecture studio classes, looks uniquely lived-in. Some are lined with paper scraps and multicolored Post-it notes scrawled over with budding ideas. On others, old models and collaged inspiration boards are speckled with confetti-like eraser shavings and chips of plaster. A few desks, piled high with abandoned prototypes, worn-in building materials, tall T-Square rulers, and capless Olfa knives look like well-stocked, well-loved tool boxes, ready for use. But the desks don’t always start off looking like that: With expansive clean white surfaces, white cork boards, and white shelves just above eye level, every desk begins as a blank canvas. Peering closer into the desks, I sit down with four studio students to to learn about how they make the spaces their own. Kanna Atarashi, a Barnard junior majoring in urban studies and concentrating in architecture, invites me into her space in 116B Lewisohn, pulling a second old, four-legged wooden stool up to her desk. 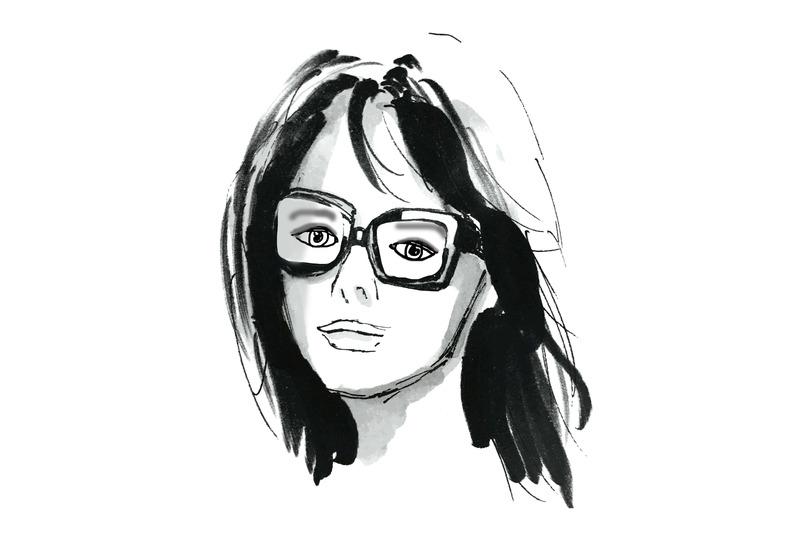 Atarashi discovered her passion for design during her first year at Colgate University, but decided to transfer to Barnard for her sophomore year to be in to New York City. This semester, she’s taking Architectural Design I, a course which explores how architectural design is a means of cultural communication and grants her studio space. 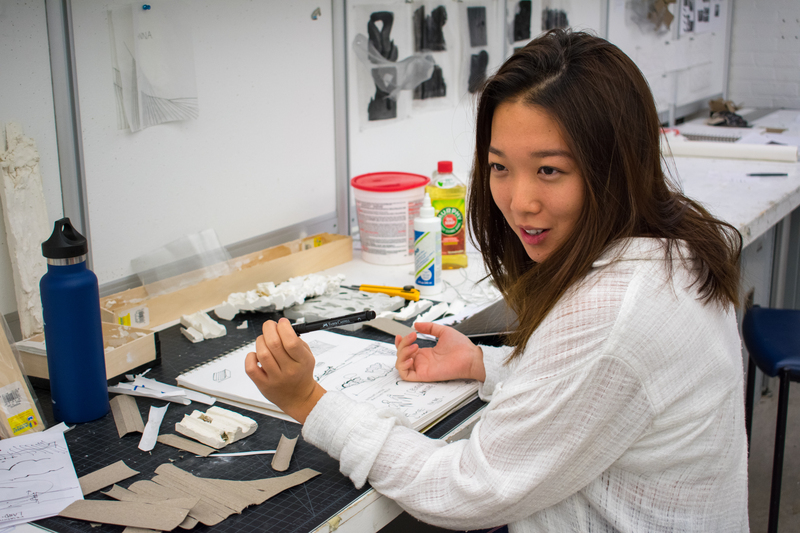 This semester, Atarashi and her Design I classmates have to design public playscapes and bike shares for Roosevelt Island, a narrow, two-mile-long island that lies in the East River between Manhattan and Queens. This project, and many others assigned in Design I, are focused on urban planning for New York City. So, when conceptualizing and executing her projects, Atarashi brings what she has learned from both her urban studies major and her architecture concentration to her desk space. Rather than cleaning up after each work session, Atarashi keeps every material, scrap, and project piece sprawled out across the length of her desk. “I can’t bother to clean it up,” she says, laughing. But, walking me through her current project, she explains that being able to see and interact with tangible pieces of her projects—slices of cardboard, hardened and chipped plaster fragments, dried up super glue strings—on a regular basis helps her visualize her projects’ trajectories and push them forward. The messy desk keeps her organized, at least until she wipes it clean at the end of each semester. 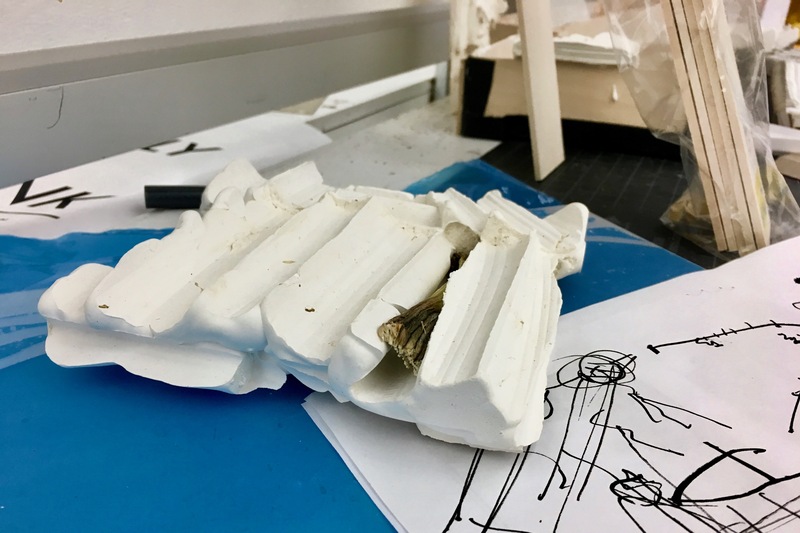 Atarashi remembers how one of her adjunct professors, Madeline Schwartzman, had her Architectural Representation: Abstraction class observe organic fruits and vegetables decaying on their desks over time. As the months passed, fuzzy green and white mold blanketed beets, potatoes, and bell peppers. Gradually shriveling up into strange, contorted shapes, the rotting produce started emitting funky smells that circulated the room and enveloped every student’s desk space. Now, practicing the design techniques she learned in Abstraction, Atarashi is using vegetables again. Inspired by how capillary action in celery mirrors the movement of flowing waves, she and her studio partner began their current joint project for Design I by plastering celery stalks into molds. From there, they sketched the stalk’s fibrous bumps and ridges, mapping out and studying its slight, rolling modulations with black Faber-Castell pens. Neither the mess of materials nor the moldy vegetables and their wafting pungent odors ruined the studio space’s clean, white aesthetic. The mess and decay guide Atarashi and her classmates toward new observations of how nature and space evolve over time. 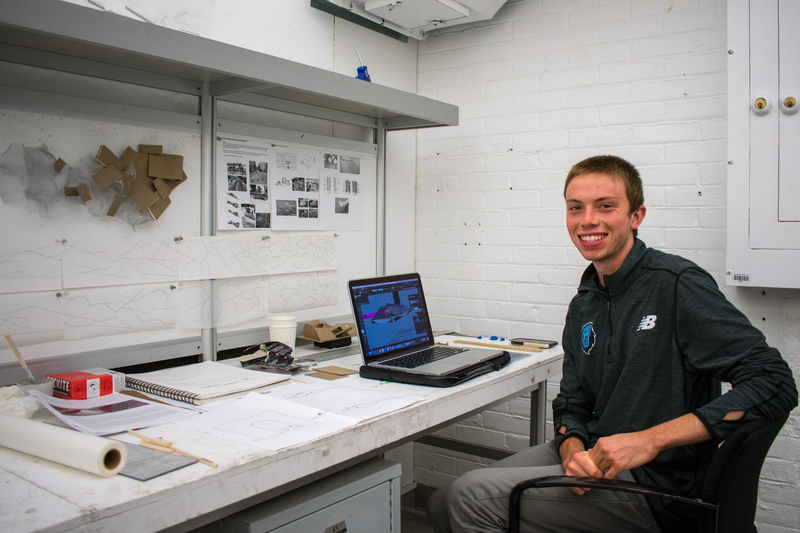 For Daniel Schumacher, a Columbia College junior majoring in architecture who also works in 116B Lewisohn for Architectural Design I, the best thing about the studio space is that its open floor plan lets students and professors walk around easily and see what each student is working on. Schumacher’s desk is tucked in the back left corner of the studio. He talks me through his architectural study model, which is made of wire mesh and chipboard paper, and proudly pinned on his cork board. Schumacher decided to make this model to illustrate how fluid movement transitions to rigid movement, like the ebb and flow of water hitting against rocks along an island shoreline. Schumacher has a project critique in the morning, so he will spend most of the next fourteen hours putting the final touches on his model. He’ll break up these working hours by standing up, walking around, and talking to his classmates about their work—which might inspire his own. I revisit 116B Lewisohn later that day. This time, Mackinley Wang-Xu, a sophomore in the School of Engineering and Applied Science studying civil engineering, ushers me in through the same metal double doors. I sit down with him at his desk. 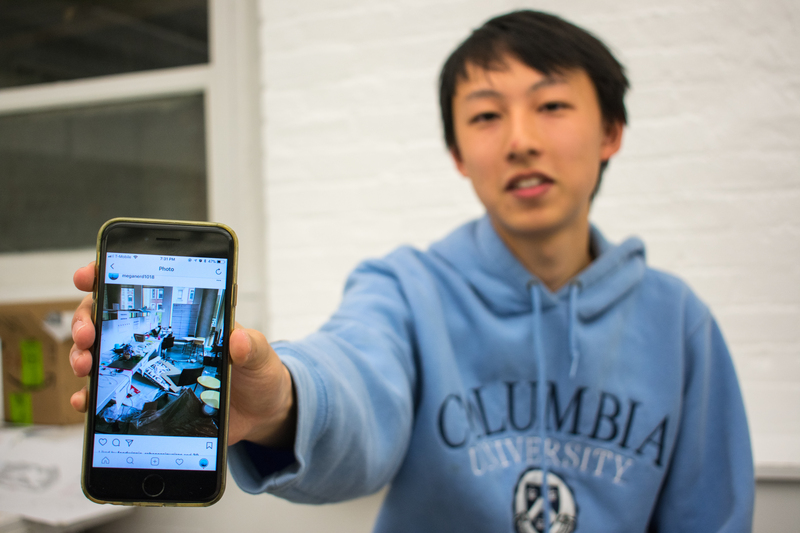 Before I can ask him any questions, Wang-Xu quickly explains how he’s taking Architectural Design I to develop an architecture portfolio in preparation for graduate school. He dives into a detailed, exceptionally animated explanation of how the desks are organized in rows by class. It is as if the studio space fills Wang-Xu with energy, and it’s infectious. 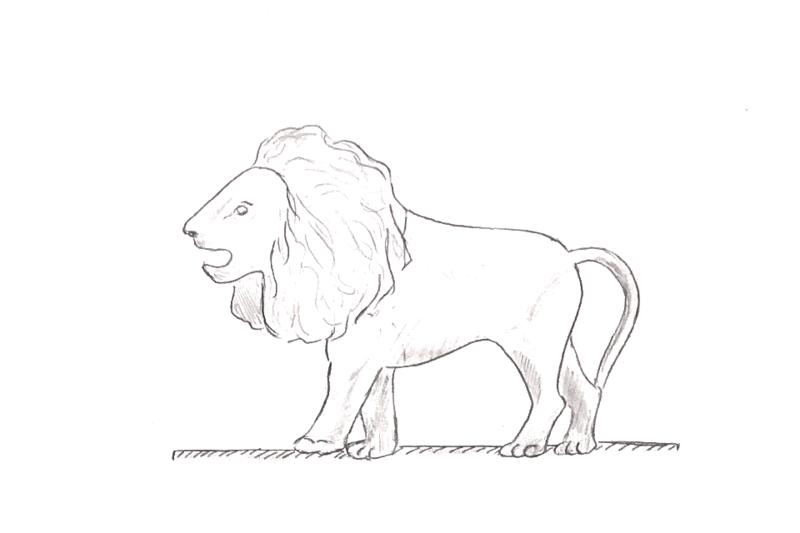 When inspiration pops into Wang-Xu’s head while he works at his studio desk, he grabs the nearest piece of paper to sketch or jot down the idea before it escapes him. This spontaneity makes his space “really, really messy” like Atarashi’s, until he takes the time to clear the scrappy piles of inspired sketches away. He begins flipping through his sketchbook, showing me series of curved lines, random corner doodles, and pages of more methodical plan drawings for his architectural models. Wang-Xu twists away from me to grab a concrete casting model sitting on the desk behind him. For his current project, Wang-Xu and his project partner poured liquid concrete over cut up pieces of foam board into a square container to study the concrete’s movement. Like a river gliding over rolling hills, the thick concrete flowed into the box and over the foam board fragments in it, creating varying slopes, splits, and elevations once it set. Reflecting on his first two semesters spent in Abstraction and Perception studio classes, Wang-Xu remembers how the room looked “absolutely nasty” leading up to final reviews, not like the aesthetically pleasing, Instagram-ready backdrop it was at the beginning of the year. Like the rotting vegetables and the desk clutter, the mess of final review is not a bad memory for Wang-Xu or his classmates. The studio was gross, but the students loved it for that. 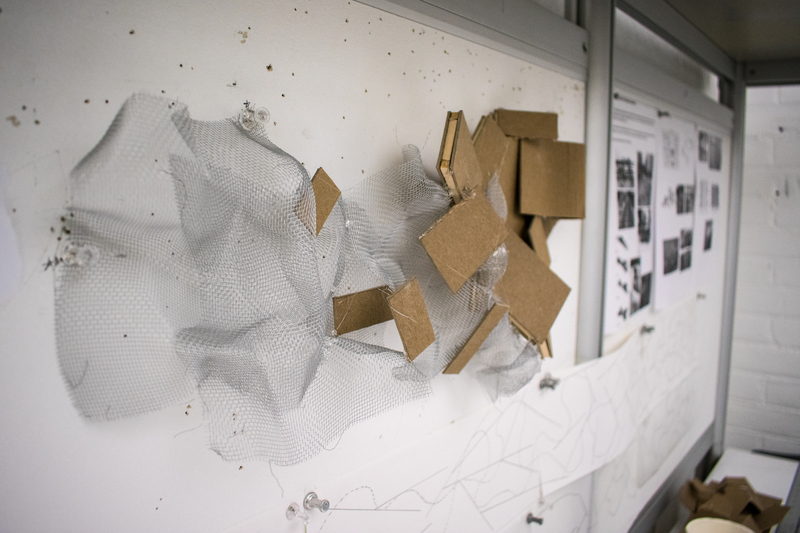 For Wang-Xu, the architecture studio is not just a classroom—it is a place for synthesis, where subjects morph and merge together. Every student has a different background and philosophy. Working in the studio space, “you are all faced with the same problem, but you approach things very differently,” Wang-Xu says. It is a space for collaborative learning and creation, where diverging thoughts, eventually, through the project process, converge and coalesce in the form of a building, a home, a structure, a landscape. Across Broadway in Barnard’s Diana Center, there is a second, similarly clean, white, blank-canvas studio space. 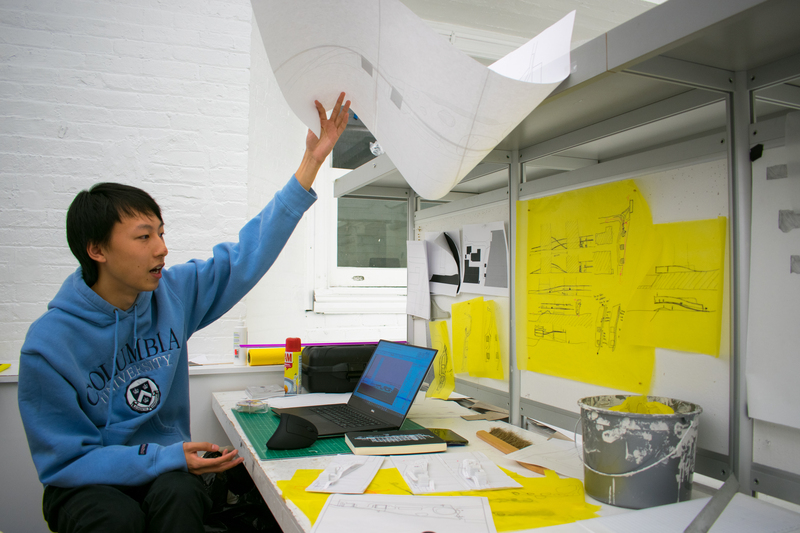 This architecture studio, 404 Diana Center, however, is far newer than 116B Lewisohn Hall. It has a crisper coat of paint, cork boards with fewer pinholes, and desks less marked up with dents and scratches. 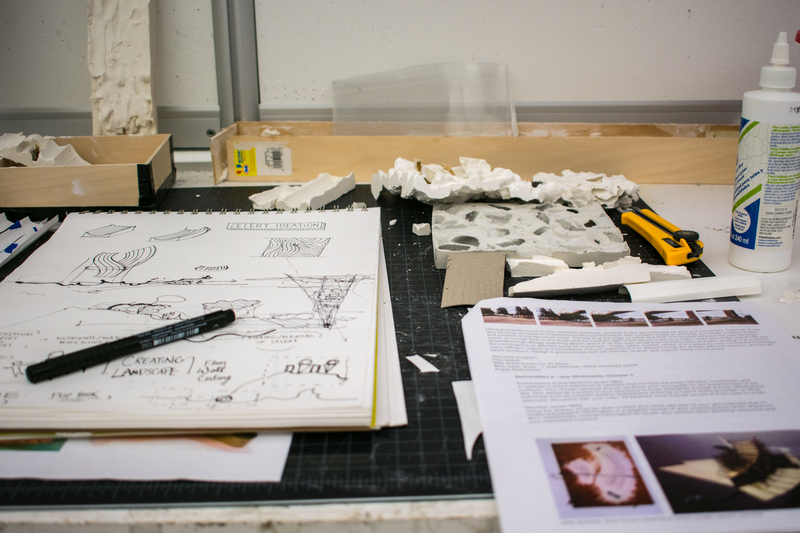 Here, Rachel Fischer, a Barnard-Jewish Theological Seminary Double Degree sophomore and prospective architecture major, works at a personal desk for her Architectural Representation: Abstraction class, which teaches spatial analysis, the design process, and principles of abstract representation through architectural drawing and model making. Fischer has been interested in the relationship between science and art since she was a kid. She carried this childhood interest into high school by taking apart everyday objects or feelings—like flowers, emotions, or secrets—and using black ink, watercolor, and gouache paint to illustrate what makes them fundamentally scientific. 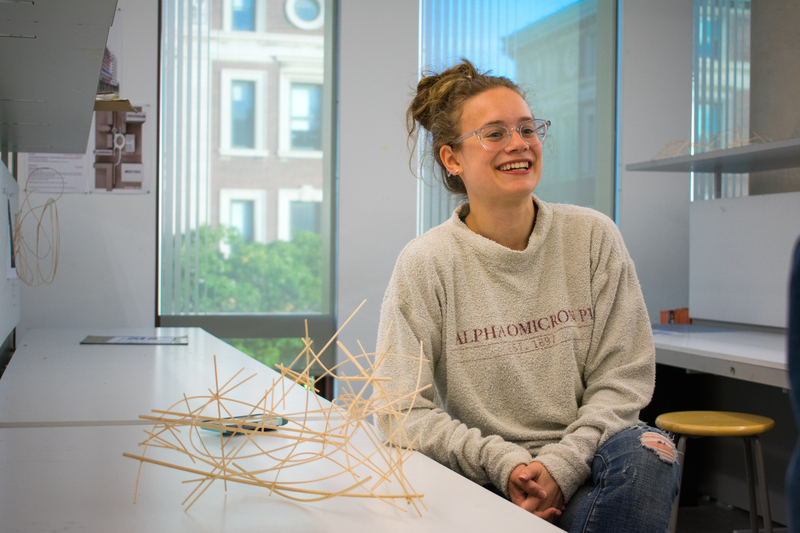 After coming to Barnard, Fischer realized that architecture was the perfect space for her to study science and art together. Listening to the composition, Fischer recognized a general upward melody with shorter bursts of up and down notes. To echo this sonic movement, she decided to complement every upward-moving wooden line and curve in her model with downward-moving ones. Fischer insists that, no matter how you rotate the model, “It should always still be the composition.” Each architectural moment, she explains, plays off of the one before. In putting together a series of random things inspired by abstract rules, Fischer creates a cohesive, progressive story. Fischer’s favorite part about her model is how light hits it. Below ground level and with very few windows, 116B Lewisohn is mostly lit by lines of fluorescent lamps. 404 Diana, on the other hand, has expansive floor-to-ceiling windows that let in midday sun. When light beams through the model’s wooden structure, shadows fall across the desk—the blank canvas—like scattered Pick-Up Sticks or an unravelling pile of grey yarn. The light paints a two dimensional shadow picture, altering our perception of the model. As the source of light moves, the model’s shadow twists, expands, and contracts, as if alive—singing the original melody that inspired its creation. Fischer admires how her model’s shadows dance across her desk, uncrossing and recrossing her legs. She grips the rim of her stool, scoots toward me slightly, and stresses how, although she has already learned so much, working on this project in 404 Diana is only a glimpse of what is to come. 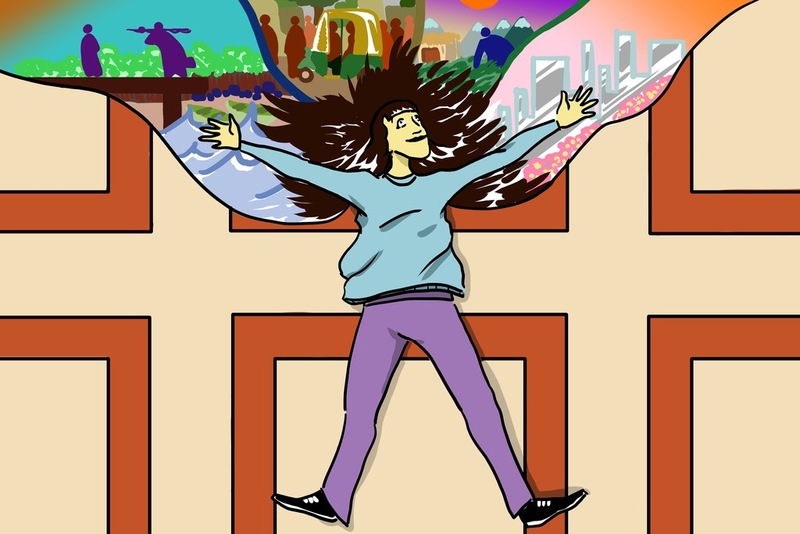 “If I keep learning, eventually I’ll be in this world,” she says.